CAPITALAND Commercial Trust (CCT) is selling Twenty Anson, a 20-storey office building in Tanjong Pagar, to an undisclosed buyer for S$516 million, in the biggest pure-office, real-estate deal this year. The announcement by the trust's manager on Friday confirms a report by The Business Times last month that such a divestment was in the works as part of CCT's ongoing asset portfolio reconstitution. After several bids were weighed, the development fetched a price that was 19.2 per cent above the valuation of S$433.0 million carried out last December. The price is also 20 per cent higher than the S$430.0 million CCT paid for it in 2012. Cushman & Wakefield (C&W), which brokered the deal, said it was the largest full-office transaction to date this year, dwarfing previous record-holder MYP Plaza at S$247 million. Its executive director of capital markets, Shaun Poh, said the sale "caps a robust quarter for the office investment market on the back of a rental recovery in the prime office market. "Investors remain confident of Singapore's prime office rental growth story and depleting office supply over the next three years." The price-tag for Twenty Anson, which has a balance lease tenure of 881/2 years, works out to S$2,503 per square foot of the building's net lettable area of about 206,000 sq ft.
As at March 2018, it was 94.3 per cent occupied. Its top tenants are Toyota Motor Asia-Pacific, BlackRock Advisors Singapore and BCD Travel Asia-Pacific. But the property accounts for just 3 per cent of CCT's net property income. CCT said that on a pro-forma basis, the impact of its divestment on its distributable income is expected to be neutral, as loss of net property income would be offset by interest savings from loan repayment. The sale consideration also translates to a net property yield of 2.7 per cent based on Twenty Anson's net property income of S$13.8 million for the 12 months before March 31, 2018. Assuming net divestment proceeds are used to repay existing debt, CCT said its pro-forma aggregate leverage would drop from 37.9 per cent as at March 31 to 34.5 per cent. Said Mr Kevin Chee, chief executive of CCT's manager, in a statement on Friday: "The divestment of Twenty Anson is in line with CCT's proactive strategy to reconstitute the trust's portfolio and optimise returns for our unitholders." With the shedding of Twenty Anson in the city fringe, CCT's portfolio is now more focused on Singapore's core office markets of Raffles Place and Marina Bay. Last year, it bought the office and retail space at Asia Square Tower 2 for S$2.1 billion. In 2016, it acquired the remaining 60 per cent interest in CapitaGreen (at the former Market Street Car Park site) which it did not already own for S$393 million. Last year, CCT sold a half-stake in One George Street, which is about 400 m from Raffles Place MRT Station, for S$592 million, and offloaded Wilkie Edge in the Selegie area for S$280 million. Last month, CCT also acquired a 94.9 per cent stake in the Galileo, a prime office skyscraper in Frankfurt's banking district, for 356 million euros (S$565.7 million). Said Mr Chee: "We'll continue to explore opportunities to enhance our portfolio, as demonstrated by our ongoing development of CapitaSpring in Singapore and the acquisition of the Galileo in Frankfurt." Upon completion of Twenty Anson's divestment, which is expected in the third quarter of this year, CCT said its portfolio will comprise 10 properties with a total net lettable area of 4.7 million sq ft in Singapore's Central Business District and in Frankfurt. CCT units closed three Singapore cents or 1.84 per cent higher at S$1.66 on Friday. 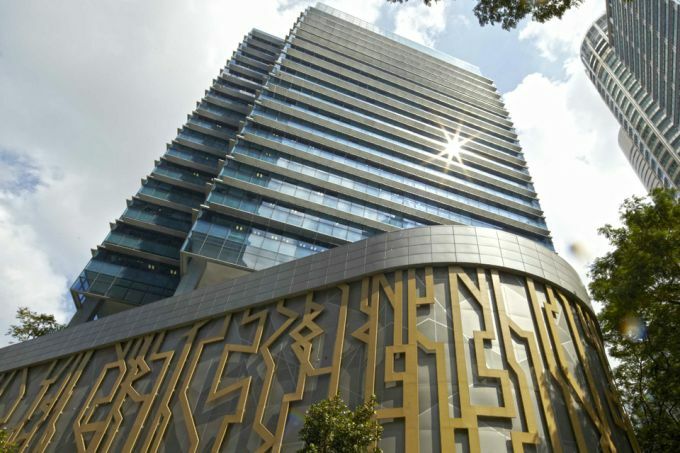 SINGAPORE - CapitaLand Commercial Trust (CCT) has agreed to sell Twenty Anson, a 20-storey office building in Tanjong Pagar, to an unrelated third party for $516 million, its manager announced on Friday (June 29). The sale price, arrived at through a bidding process, works out to $2,503 per square foot of the building's net lettable area of approximately 206,000 sq ft. The price is also 19.2 per cent above the property's valuation of $433.0 million done on Dec 31, 2017, and 20 per cent higher than CCT's purchase price of $430.0 million in 2012. The transaction is expected to be completed in the third quarter of this year. The sale consideration translates to a net property yield of 2.7 per cent based on Twenty Anson's net property income of $13.8 million for the 12 months preceding March 31, 2018. Assuming net divestment proceeds are used to repay existing debt, CCT's pro-forma aggregate leverage would drop from 37.9 per cent as at March 31 to 34.5 per cent. Mr Kevin Chee, CEO of the CCT's manager, said: "The divestment of Twenty Anson is in line with CCT's proactive strategy to reconstitute the trust's portfolio and optimise returns for our unitholders. This transaction will unlock value and enhance the trust's financial flexibility. "We will continue to explore opportunities to enhance our portfolio as demonstrated by our ongoing development of CapitaSpring in Singapore and acquisition of Gallileo in Frankfurt, Germany." Upon completion of the sale, CCT's portfolio will comprise 10 properties with a total net lettable area of 4.7 million sq ft across in Singapore's CBD - Raffles Place, Marina Bay, Tanjong Pagar and City Hall - as well as the banking district in Frankfurt, Germany. Completed in 2009, Twenty Anson has sheltered access to Tanjong Pagar MRT station. It has a total net lettable area of approximately 206,000 sq ft.
As at March 31, Twenty Anson had a committed occupancy rate of 94.3 per cent. Its top three tenants are Toyota Motor Asia Pacific Pte Ltd, BlackRock Advisors Singapore Pte Ltd and BCD Travel Asia Pacific Pte Ltd. The building for about 3 per cent of CCT's net property income. CCT said that on a pro-forma basis, the impact of its divestment on its distributable income is expected to be neutral as loss of net property income would be offset by interest savings from loan repayment. CCT was trading at $1.64 apiece, up one Singapore cent or 0.6 per cent, heading into the lunch break.